This entry was posted on October 8, 2013 by Jessica Anderson. Is your staff lacking the spark to make your company great? Improve the energy of your company by creating a Sales Incentive Program! If you already have a program, but it isn’t providing value, consider refining it. Below are some tips for creating new incentive programs and for updating existing ones. Why A Sales Incentive Program? How do you motivate people? Reward employees who perform at top levels with sales awards. The recipient of the award feels like they have made significant contributions to their company. They also feel like they are doing a better job than others, creating competition. Employees that do not receive recognition are often motivated to work harder to reach the goal next time. If created correctly, a program can be measured and updated to ensure success. Important metrics are set by the company. Meeting or exceeding these measurements is the basis for the awards. Some examples of metrics include gross dollars, percentage growth, unit sales, market share increase, and number of new clients. Regardless of the measurement, tracking occurs and the top tier performers are recognized for outstanding accomplishments. If your company doesn’t have a sales incentive program, put one into action. If you already do, consider refining it by adding new goals or adjusting it to recapture the hype behind the program. You can also add a short-term program for a one-time sales boost. Collect ideas from outside your sales department, such as customer service, operations, shipping department and management. Often times great ideas are generated by others outside of the sales team. When implementing or refining a program, it is very important to stick with it over time. Keep in mind that recognition for sales improvements has both a short and long term pay-off. Short term recognition helps boost self-worth and confidence. Long term benefits include employees feeling like their contributions are important and vital to the company’s success. If you need assistance in setting up a sales award program, please feel free to contact our President, Jeff Anderson at [email protected] Jeff is a Certified Recognition Professional and can help you with your program. Give a designer crystal award, such as this Premium Crystal Tower, as a reward for larger sales accomplishments. Trophies2Go carries a wide selection of corporate awards to fit your needs. 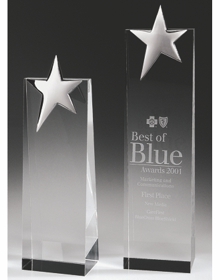 A Designer Crystal Award is a great choice for a President's Award or larger sales milestone. For an ongoing program, a perpetual plaque that can be displayed in the office is a good choice. Acrylic Awards are affordable for programs with a budget. We have many corporate awards that would be appropriate choices for recognizing outstanding sales achievement. Just browse our online catalog for ideas or call our helpful and friendly customer service staff at 1-877-926-4700 for suggestions! The presentation of sales awards can occur at staff meetings, monthly sales meetings, or annual corporate events. Recognition is more meaningful from the leaders of the company. Have the sales manager or higher-level executive, such as a VP or CEO, present the awards. It is also best practice for emphasis to be placed on the importance of the metric and how much above and beyond the recipient excelled. What message do you engrave on your awards? Below are four examples of text that can be used on your sales awards. These are only guidelines; be creative to capture the essence of your company. Sales Incentive Awards Programs are a great tool for motivation, recognition and employee retention. Your employees deserve to be recognized in a meaningful way for the time and expertise they give to your company, and that recognition will add value to your business in the form of satisfied employees!